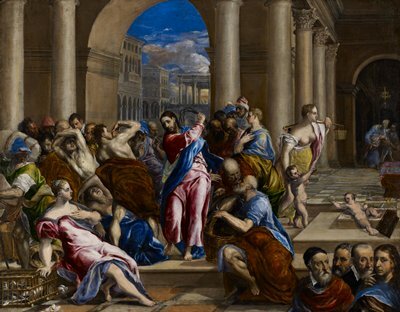 Christ’s expulsion of the money changers who were desecrating the temple in Jerusalem was a favorite theme in Counter-Reformation art. To Catholics, it symbolized purification of the church through internal reforms and the expulsion of Protestant heretics. Known for his uniquely Mannerist style, El Greco used jarring lines, confused space, and illogical lighting in this composition, contributing to the atmosphere of anger and disruption. In 1577 El Greco settled permanently in Spain. A native of Crete, he became known as “El Greco” (the Greek), but here his full signature appears in Greek letters on the step below Christ. In the lower-right corner, El Greco portrayed the four artists he regarded as the giants of the Renaissance: Titian, Michelangelo, Giulio Clovio (a miniaturist and manuscript illuminator), and Raphael.